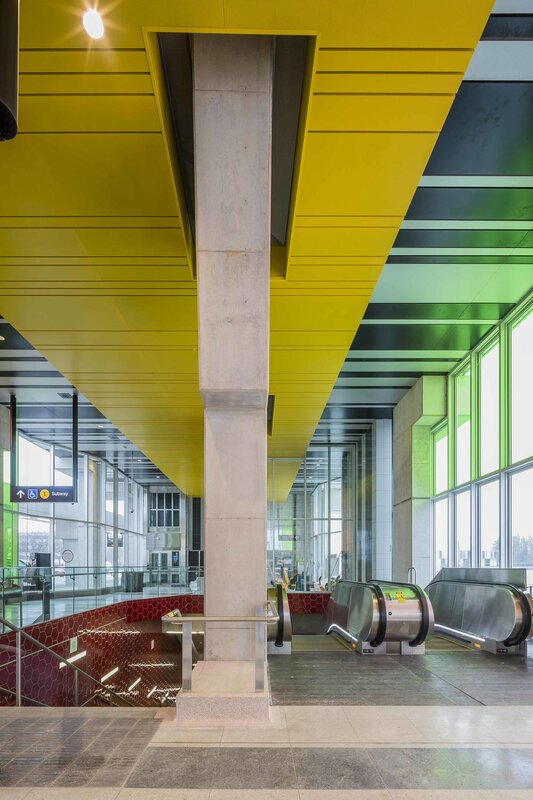 Finch West is the second subway station designed by Will Alsop in collaboration with local architect Richard Stevens as part of the Toronto-York Spadina Subway Extension. The concept defines a ‘station of light’ to provide direct and indirect daylight and sunlight into previously dark spaces. This is to provide a positive psychological effect on all passengers and staff using the station and provision of daylight would in-turn lead to reduced energy consumption. Alsop also worked with long-term collaborator, artist Bruce McLean. They have developed a concept of public art fully integrated with the architecture. The structures supporting the power substation reference Greek caryatids; the pillars supporting the underground were inspired by 6,000 year-old Minorca-style pillars.